Autoquip’s five gallon pail lift system is specifically engineered to eliminate ergonomic issues caused by the routine manual handling of 5 gallon pails. Its simple and flexible free standing base allows for portable use and the centering of two pails at once. Its large, 10-inch center feed mixing blade and slow speed reduces process issues. 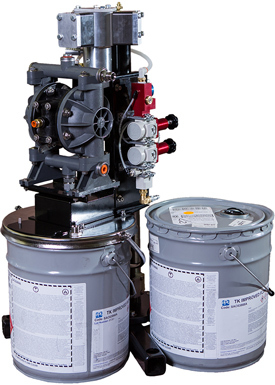 Additional features include mounting for air motor and air flow control, a dual lock system, a center feed suction tube, and easy access for agitator and lifting speed control.